As Internal Docs Show Major Overreach, Why Is FBI Spying on Opponents of Keystone XL Pipeline? | Democracy Now! As Internal Docs Show Major Overreach, Why Is FBI Spying on Opponents of Keystone XL Pipeline? JUAN GONZÁLEZ: A new report confirms for the first time that the FBI spied on activists in Texas who tried to stop the construction of the Keystone XL pipeline. The report is based on FBI documents obtained by The Guardian and the Earth Island Journal. The documents also reveal that the FBI failed to get approval before it cultivated informants and opened its investigation, which was run from its Houston field office. The files document, quote, “substantial non-compliance” with Department of Justice rules. Much of the FBI’s surveillance took place between November of 2012 and June 2014. AMY GOODMAN: The Tar Sands Blockade mentioned in the report was one of the main groups targeted by the FBI. Agents in Houston also told TransCanada they would share, quote, “pertinent intelligence regarding any threats” to the company in advance of protests. Adam Federman, thank you so much for joining us from Burlington, Vermont. Talk about this most recent exposé. How do you know the FBI was spying on those who are opposed to the Keystone XL? ADAM FEDERMAN: Yeah, the recent investigation is based on more than 80 pages of documents that we obtained through a Freedom of Information Act request. And the most striking thing about them is that they demonstrated for the first time that the FBI opened an investigation into anti-Keystone pipeline campaigners in Texas in 2012, late 2012, and that investigation continued through 2013, despite the fact that it was opened without proper approval from within the FBI. And what’s interesting about them is that they show extensive interest in Tar Sands Blockade and activists organizing in Houston, particularly in, yeah, neighborhoods in East Houston, where tar sands oil would eventually end up at the refineries that are based there. JUAN GONZÁLEZ: And in terms of the most surprising revelations that you found in these documents, could you talk about that? ADAM FEDERMAN: Yeah, there are several. I mean, the fact that the investigation was opened without proper approval is probably most noteworthy. The FBI requires approval from legal counsel and a senior agent for investigations that are described as sensitive, and those include investigations into political or religious organizations, media institutions, academic institutions, and basically they set a higher threshold for opening an investigation. So, the fact that the Houston domain failed to do that obviously violates agency protocol. But I think, more broadly, the documents also sort of illuminate the FBI’s characterization of environmental organizations and activism in the country. You know, the sort of opening salvo in the investigation is a synopsis of what they call environmental extremism, and that sort of undergirds the entire investigation and has also—you know, we’ve seen the same sort of language used in other contexts, not just surrounding Keystone pipeline. AMY GOODMAN: Adam, many of the—looking at the quotes in the FBI documents, they talk about, as you said, the environmental extremists and say, quote, “Many of these extremists believe the debates over pollution, protection of wildlife, safety, and property rights have been overshadowed by the promise of jobs and cheaper oil prices. The Keystone pipeline, as part of the oil and natural gas industry, is vital to the security and economy of the United States.” Can you explain these documents? ADAM FEDERMAN: Yeah, I mean, that quote is really quite amazing for a number of reasons. Mike German, a former FBI agent who’s now at the Brennan Center and who we worked with on this story, you know, said that that characterization would include just about anyone who watches the evening news. I mean, it’s such a broad brush to tar—to describe environmental activists as extremists simply for being concerned about things like pollution, wildlife and property rights. And then the FBI also goes on to claim that the Keystone pipeline is vital to the national security and economy of the United States, which of course is highly controversial and contested. And as I’m sure your viewers know, the State Department is still deliberating over whether to approve the northern leg of the pipeline itself. So that question remains open; however, it seems that the FBI has taken it upon its own to suggest that the pipeline is crucial to U.S. national security and financial security. ADAM FEDERMAN: Yeah, it’s a fascinating document. And the story behind how I obtained it is because of the fact that that very document was used by the Pennsylvania Department of Homeland Security to justify surveillance of anti-fracking groups in the state. And it essentially captures the FBI’s thinking on, you know, the threat of environmental extremism to—specifically to the energy industry. And this is laid out, as you say, in 2010, so I think that this is sort of the foundation for the FBI’s approach to the environmental movement more broadly. And I think, with these more recent documents, we’re seeing that sort of carried out in real time. And we also know that the FBI has had high-level meetings with TransCanada and that local and state law enforcement along the pipeline route and in Pennsylvania and elsewhere has actively investigated and spied on environmental activists of, you know, all stripes. And it’s quite systematic, and I do think that the FBI is in many ways leading the charge. AMY GOODMAN: You report the FBI’s monitoring of Tar Sands Blockade activists failed to follow proper protocols for more than eight months. I want to read the FBI’s response: quote, “While the FBI approval levels required by internal policy were not initially obtained, once discovered, corrective action was taken, non-compliance was remedied, and the oversight was properly reported through the FBI’s internal oversight mechanism.” That’s what the FBI said, acknowledging they didn’t initially get approval. Adam, as we wrap up right now, if you can talk about what—the legality of what the FBI did, in what you released today in the Earth Island Journal and The Guardian, and also in your past reporting on FBI spying on activists? ADAM FEDERMAN: Well, I think, unfortunately, it’s perhaps not the exception that the FBI has opened an investigation without proper approval. In 2011, the inspector general issued a report showing widespread cheating on a test that was designed to prevent this very kind of thing from happening. So it essentially demonstrates a lack of internal control. But more broadly speaking, the question that I think we need to be asking is whether the investigation, opened properly or not, should have been conducted to begin with. I mean, Tar Sands Blockade is committed to nonviolent civil disobedience. They’ve been very open and transparent about their activism and work. And I think the question is whether this investigation should have been opened to begin with, and, quite frankly, if the FBI is actively investigating other anti-Keystone pipeline activists or anti-fracking activists in other states. AMY GOODMAN: Adam Federman, we want to thank you for being with us, contributing editor to Earth Island Journal, where he covers the intersection between law enforcement and the environment. 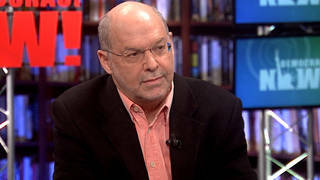 He co-authored the new investigation published by The Guardian, “Revealed: FBI Violated Its Own Rules While Spying on Keystone XL Opponents.” We’ll link to that story at democracynow.org. When we come back, it’s the 30th anniversary of the MOVE bombing, when the Philadelphia police bombed a neighborhood. Stay with us.